EAST VILLAGE — An East Village mural of rock legend Joe Strummer will be repainted by the graffiti artists who created it a decade ago, after construction workers tore it down on Monday. The internationally known mural, which drew dozens of spectators each day to the Niagara bar at East Seventh Street and Avenue A, was painted in 2003 to commemorate Strummer, the lead singer of The Clash, who had died a year earlier. But the outdoor mural, which faces the south side of Tompkins Square Park, had to be removed because its underlying brick wall was crumbling and posed a danger to the public, according to Niagara's owners. "I didn't know what day it was going to come down, so it was a bit of an emotional day," said Niagara co-owner Jesse Malin, 45, who is also a musician and knew Strummer when the rock star patronized the bar. Helm Management, which manages the building at 132 E. Seventh St., will take three to four weeks to replace the brick wall, Malin said the company told him. As soon as the façade is repaired, the mural's original painters — graffiti artists Dr. Revolt and Zephyr — will return to replicate their work, Malin noted. The mural was created for a music video in the wake of Strummer's 2002 death due to an undiagnosed heart defect, according to Malin. 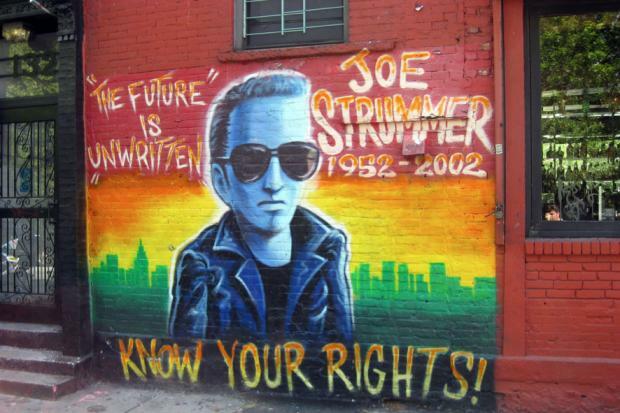 Once the video was finished, Malin decided to keep the image of a young sunglasses-clad Strummer with the phrase "The Future is Unwritten" painted beneath it as a memorial. "It gets probably 100 photos taken each day," he said. On Tuesday, the stripped wall still had a few remaining bricks showing a glimpse of the mural. "One woman even came and took a brick as a souvenir," said the building's super, Jermaine Jeffrey, 29, who watched the mural come down. The story was first reported on the blog EV Grieve. Malin said he looked forward to seeing the mural return. "Unfortunately, Joe can't come back," he said, "but the mural can."